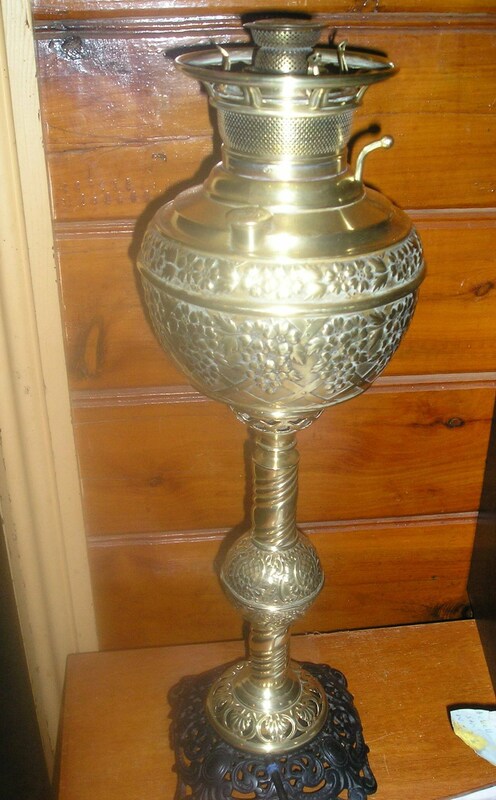 The column lamp holds a unique place in the family of Miller Central draught lamps. Although far more decorative than a table lamp, it still holds true to form and function making it much plainer than to its ‘big brother’ – the Banquet Lamp. Like all lamps, the Column lamp was made in many styles, with the column being the chosen medium for variation. These lamps exist with relatively plain ‘Corinthian’ columns made from cast spelter, onyx or marble. Again, you got what you paid for. These lamps can be found with the tripod and 10” dome shade, or 4” etched or painted globe shade. Originally the globe was the more expensive option. Column lamps have the same holding capacity, candlepower and burner time as the Miller No. 2 table lamp but do not have the removable font that the Banquet Lamps have. 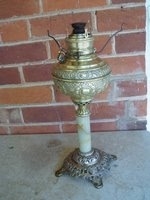 An Unusual (and possibly very early) embosed brass lamp. The wick raiser is very similar to that of the 'Rochester' lamps that Miller made prior to going into production for himself. c.1892? A 'Juno' embossed brass column lamp with a nice onyx (marble) column on a cast brass base fitted with a tripod for a 10" dome shade. 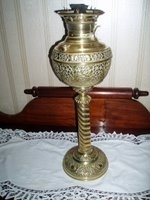 A really nice embossed brass column lamp. Of 'New Juno' type it has a nice cast spelter base with a twist brass column. In the middle of the column is a nice embossed brass 'ball'.